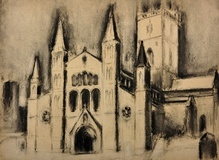 Will Roberts - St Davids Cathedral, Wales - Online gallery supplying original fine art. Trending Modern British and Contemporary Welsh. Available for sale from Big Sky Fine Art; this original Charcoal drawing by Will Roberts.<br> The drawing is presented and supplied in a sympathetic and contrasting contemporary frame to suit the subject colouration and behind non-reflective glass. The original backboard that carries the artist’s signing, title and date has been retained.<br> <br> Will Roberts was one of Wales’ most popular and respected artists, and is now considered to be among the most important British artists of the twentieth century. <br> <br> He was born in Ruabon, the son of a railwayman of the Great Western Railway. The family moved to Neath, South Wales, in 1918, and apart from his service during the war, Roberts lived there for all his life. He displayed a talent for drawing as a child and in 1926 he won a part-time scholarship, which enabled him to study at the Swansea School of Art. Altogether, he was an artist for more than 70 years, painting right up to his death at the age of 92.<br> <br> In 1945 Roberts met the artist Josef Herman in 1945 and they became friends. Herman gave Roberts new impetus as an artist and helped him develop his expressionist style. They enjoyed a creative collaboration for many years and worked very much as equals. Of the two it was Roberts who focused on the personal rather than the political.<br> <br> In 1949 Roberts participated in an Arts Council of Great Britain touring exhibition of the work of contemporary Welsh artist. The 1950’s saw him exhibiting in leading London galleries but by the early 1960’s he thought expressionist painting had been somewhat sidelined, so turned to exhibiting predominantly in Wales. He showed at the leading Welsh galleries regularly for many years, particularly the Tegfryn Art Gallery, Menia Bridge, Angelsey.<br> <br> In the 1960’s he undertook a series of large charcoal drawings of men at work in the local steel and tine plate mills – the furnace men and the roller men - in order to return a sense of grace and respect to a dying craft. He painted them not so much as an historical record but as part of the landscape.<br> <br> In 1962 Roberts won the Byng-Stamper Prize for landscape painting<br> <br> In 1969 Roberts was featured in a solo exhibition at Roland, Browse and Delbanco, London and at the Howard Roberts Gallery, Cardiff. His work was also regularly selected by the Royal Academy for their Summer Shows and a major retrospective of his work was held at the Tate in 1981<br> <br> Roberts was awarded an honorary Fellowship by University College, Swansea in 1992, and in 1994 a retrospective exhibition of his work was the centerpiece of the arts exhibition at the National Eisteddfod of Wales. In 1998 the National Library of Wales accepted from Roberts a donation of 600 drawings. 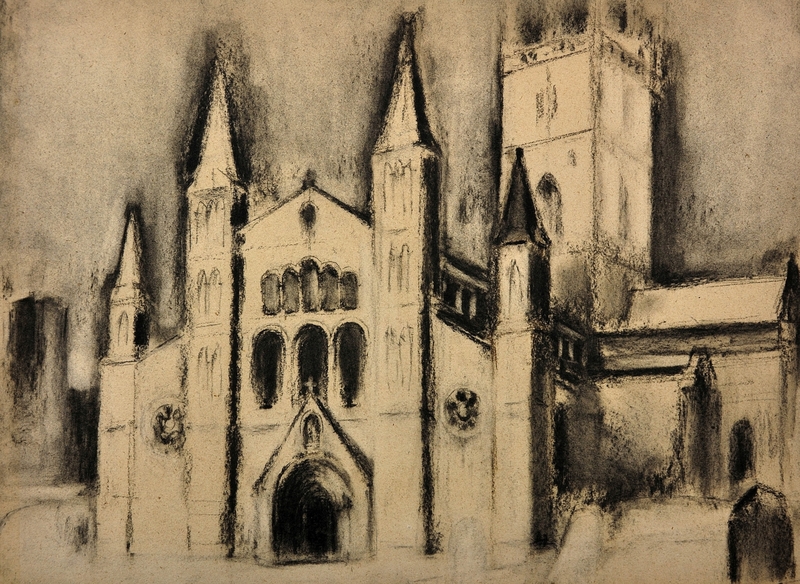 <br> <br> Roberts died in Neath on 11th March 2000, where his charcoal drawings of the Stations of the Cross may be seen in St. David’s Church. This is apt because throughout his life Will Roberts was a churchman and a man of religious conviction.<br> <br> <br> A memorial of drawings and some paintings was shown as the National Library of Wales in 2001and at the National Museum of Wales in 2002. <br> <br> Roberts enjoyed huge respect and warmth during his life and his works today are much valued for their humanity and honesty. He painted a landscape which was scarred and valued the industrial heritage of his homeland. More than that however he valued the ordinary people who lived there. He said “Man is never absent from my paintings, even though he is not always seen”. Many of his paintings are of his wife Phyllis, who he credited with being the main source of his inspiration, and of the everyday life of Neath.<br> <br> Today his works are held in numerous public collections and he is widely acknowledged as one of Wales’ modern masters.<br> <br> This original charcoal piece is impressive in its presence and scale. It depicts a close- up view of St. Davids Cathedral, which is in the centre of the city of the same name in Pembrokeshire, Wales. St. Davids, lying on the River Alun on St. Davids peninsula, is the smallest city in Britain in terms of both size and population. It is also the most westerly point in Wales. The drawing depicts the front of the beautiful Gothic cathedral with its tall towers and wonderful range of perpendiculars. The current Bishop of St. Davids is a woman, the first in Wales. Available for sale from Big Sky Fine Art; this original Charcoal drawing by Will Roberts. The drawing is presented and supplied in a sympathetic and contrasting contemporary frame to suit the subject colouration and behind non-reflective glass. The original backboard that carries the artist’s signing, title and date has been retained. Will Roberts was one of Wales’ most popular and respected artists, and is now considered to be among the most important British artists of the twentieth century. He was born in Ruabon, the son of a railwayman of the Great Western Railway. The family moved to Neath, South Wales, in 1918, and apart from his service during the war, Roberts lived there for all his life. He displayed a talent for drawing as a child and in 1926 he won a part-time scholarship, which enabled him to study at the Swansea School of Art. Altogether, he was an artist for more than 70 years, painting right up to his death at the age of 92. In 1945 Roberts met the artist Josef Herman in 1945 and they became friends. Herman gave Roberts new impetus as an artist and helped him develop his expressionist style. They enjoyed a creative collaboration for many years and worked very much as equals. Of the two it was Roberts who focused on the personal rather than the political. In 1949 Roberts participated in an Arts Council of Great Britain touring exhibition of the work of contemporary Welsh artist. The 1950’s saw him exhibiting in leading London galleries but by the early 1960’s he thought expressionist painting had been somewhat sidelined, so turned to exhibiting predominantly in Wales. He showed at the leading Welsh galleries regularly for many years, particularly the Tegfryn Art Gallery, Menia Bridge, Angelsey. In the 1960’s he undertook a series of large charcoal drawings of men at work in the local steel and tine plate mills – the furnace men and the roller men - in order to return a sense of grace and respect to a dying craft. He painted them not so much as an historical record but as part of the landscape. Roberts was awarded an honorary Fellowship by University College, Swansea in 1992, and in 1994 a retrospective exhibition of his work was the centerpiece of the arts exhibition at the National Eisteddfod of Wales. In 1998 the National Library of Wales accepted from Roberts a donation of 600 drawings. Roberts died in Neath on 11th March 2000, where his charcoal drawings of the Stations of the Cross may be seen in St. David’s Church. This is apt because throughout his life Will Roberts was a churchman and a man of religious conviction. A memorial of drawings and some paintings was shown as the National Library of Wales in 2001and at the National Museum of Wales in 2002. Roberts enjoyed huge respect and warmth during his life and his works today are much valued for their humanity and honesty. He painted a landscape which was scarred and valued the industrial heritage of his homeland. More than that however he valued the ordinary people who lived there. He said “Man is never absent from my paintings, even though he is not always seen”. Many of his paintings are of his wife Phyllis, who he credited with being the main source of his inspiration, and of the everyday life of Neath. Today his works are held in numerous public collections and he is widely acknowledged as one of Wales’ modern masters. This original charcoal piece is impressive in its presence and scale. It depicts a close- up view of St. Davids Cathedral, which is in the centre of the city of the same name in Pembrokeshire, Wales. St. Davids, lying on the River Alun on St. Davids peninsula, is the smallest city in Britain in terms of both size and population. It is also the most westerly point in Wales. The drawing depicts the front of the beautiful Gothic cathedral with its tall towers and wonderful range of perpendiculars. The current Bishop of St. Davids is a woman, the first in Wales.